Gordon Hayward was elated to put "dark memories and dark times" behind him and make his first appearance in over a year as the Boston Celtics beat the Philadelphia 76ers. A gruesome ankle injury in the 2017-18 opener ruled Hayward out for the remainder of the campaign, but he played 24 minutes as the Celtics started the new season with a 105-87 win at TD Garden. 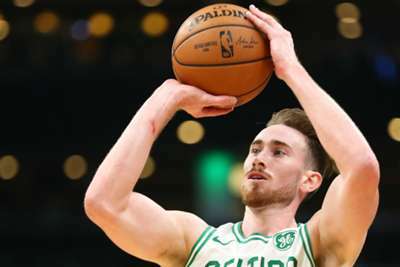 Hayward – who posted 10 points, five rebounds and four steals against the Sixers – admitted it made him recall some unpleasant moments, but they did not linger for long once the game got underway. "It brought back a lot of memories, a lot of dark memories and dark times, but to be honest it was cool to see some of the progression," said Hayward. "It was amazing to be out there on the court again for a regular-season game. My adrenaline was definitely pumping those first three or four minutes. I think everybody's adrenaline was pumping, because it was sloppy at first, but it was great just to be out there. "That was a big step for me mentally. It was a big confidence booster just to finish that first game. Being back out on the court – that was a big hurdle. "[The injury] definitely crossed my mind … just tried to get that out of my head as soon as I started playing and as soon as you're out on the court some of that disappears. "There's definitely still a long way to go for me to be where I want to be at, but it was a great first step and a great team victory." Brad Stevens confirmed Hayward would be on a minutes restriction to start the season and the forward knows it will take time for him to rediscover his previous level. "It's just part of it. Part of it is just having patience and knowing that it's not all going to come at once," he said. "I think as long as I can do things when I'm out there on the court that can help us get wins, I'll be happy."